Or maybe there was no plan and it was all a bit of a rush? The Combustion Engineering Association (CEA) realised recently that there was no clear guidance available for people who wish to hire steam and hot water boilers, nor was there a generic document agreed by all the major boiler hire companies and equipment suppliers that covered all the issues that needed to be addressed. A group of specialists therefore met in 2018 to draft a guidance document and agree a way forward; CEA BG08 is the result – a comprehensive guide on all the main issues that a company hiring a boiler will need to consider. Operation and maintenance of the temporary plant. So every person involved in the process of installing and operating temporary boilers has a duty to help ensure the boiler is safe to operate, and with increasing emphasis on environmental matters, a similar duty to prevent or minimise pollution. At some time in their life most installations of steam and hot water boilers will require a maintenance outage or a significant replacement. Sometimes this is frequent, often planned, such as for the annual inspection of a steam boiler, and sometimes it is a relatively rare occurrence where boilers are well managed and the capacity available on site is sufficient to cover for shutdowns and outages, and only a total replacement or sudden unexpected failure may need a temporary installation. 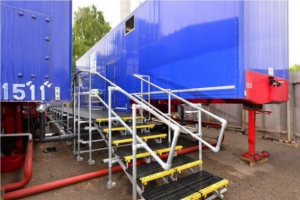 Suppliers of temporary boilers routinely receive both urgent and routine requests for stand-by plant, and there is a thriving industry in the UK to respond to customers’ needs. It is estimated that there are approximately 500 mobile boilers in the UK, with around 80% on site at any one time, and with rental periods ranging from a few weeks to a year or more in some cases. 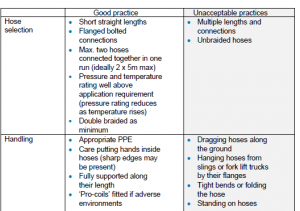 Many sites have a well-practised routine for having temporary plant on site, and the ideal situation where this is a known activity is to have a full set of correctly sized connection points available to which the temporary plant can be easily attached. This is the default position, and many of the problems that arise every year from the installation of temporary boilers can be reduced or eliminated by providing permanent connection points and suitable locations for the temporary plant. However, some sites have not been designed with temporary plant in mind, or there are other restrictions which can make the temporary installation much more challenging, and the guidance is intended to help customers achieve a safe and secure solution to a temporary problem. All of the relevant legislation and much of the available guidance on this subject will apply just as much to the temporary installation as to the permanent one; in addition, there are some significant new issues that must be considered to ensure that the temporary installation is safe. A clear plan for the eventuality of hiring in boilers is documented, discussed with all stakeholders, and regularly reviewed for suitability. The more effort that is put into the creation of a suitable and sufficient risk assessment before the event, the greater the safety and success of the temporary installation when that day arrives. Companies that hire out boilers will offer a range of possible solutions to customers, the simplest and most routine being the delivery and collection of a boiler that the customer requires to meet pressure and volume specifications for steam or hot water. These mobile systems will be serviced, currently certificated under PSSR, well maintained, and equipped for the role they have to perform, but they are only one part of the equation. decommissioning and return of the hired boiler in good condition, well maintained, empty of all fluids, and complete. General advice is that boilers scheduled to be on site for less than one year could be installed as temporary plant, but for any longer than one year a permanent, solidly piped installation is recommended. BG08 is one of a series of guidance documents written and published by the CEA, and many of them will be on the shelves of boiler operators and boiler house designers as standard reference material. 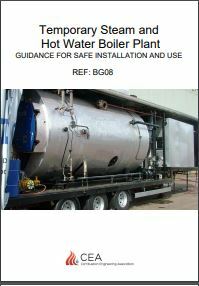 Apart from following the guidance in BG08 for temporary plant installations, CEA have also produced, in association with SaFed, a new edition of BG01, Guidance on Safe Operation of Steam Boilers – the guidance in BG01 is just as valid for temporary installations as it is for permanent boiler houses. This new version of BG01 is to be formally launched at the next CEA conference on 4th June at Eastwood Park Conference Centre (places still available), and copies of BG01 are available from the CEA web site along with details of how to obtain all of the other CEA Guidance documents, including BG08.